Boasting a sturdy, durable stainless steel body that is suitable for all stove types, including induction, this egg poacher pan is equipped with an innovative Bakelite handle that stays cool to the touch to keep hands protected from high heat. This easy-to-use poacher pan features a convenient nonstick coated cooking surface that makes food release super easy and clean-up quick. 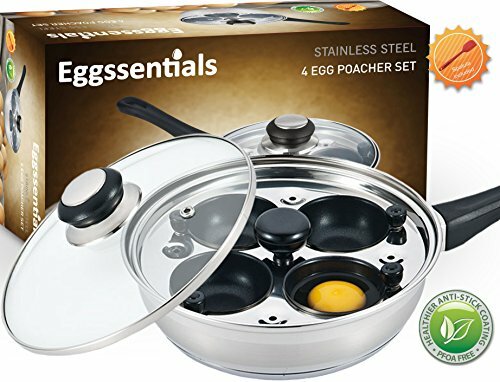 Included tempered glass lid with Bakelite knob lets you monitor the eggs while cooking, and the integrated steam vent ensures the proper amount of moisture, so your eggs are cooked to perfection every time. Insert and individual nonstick cups can be removed easily without the use of extra tools and are dishwasher safe. 1- Place half inch of water in the bottom of the poacher pan, and bring it to a boil over medium heat. Once the water is at a boil, let it simmer. 2- For even easier cleanup, we recommend you use a touch of nonstick spray or butter (not required), and then crack an egg into each cup. 3- Insert the tray and cups into the pan, and place the lid on top. 4- You will notice that steam is gathering under the lid. The steam cooks the eggs until your desired liking. It only takes about 5 minutes from start until finish, so you can enjoy your poached eggs in no time. 5- Once cooked, remove the tray from the pan, and use the knobs on each cup to gently pour each perfectly-shaped poached egg out (no extra tools needed). Then, simply use a napkin to handle the knobs once they have been heated up by the steam. A HEALTHIER BREAKFAST ALTERNATIVE- From Eggs Benedict to Eggs Sardou and many more other egg-inspired meals, the easy-to-use Deluxe Egg Poacher Pan from PremiumWares lets you prepare up to 4 extra large, perfectly poached eggs at a time, so you can start your day the right way and enjoy a delicious, healthy breakfast without any hassle. HIGH-QUALITY MATERIAL AND PERFORMANCE - Unlike the cheap, delicate poacher pans on the market, this deluxe pan boasts a sturdy, heavy stainless steel body that is suitable for use with all stove types, including induction. Premium 3-ply aluminum encapsulated bottom eliminates hot spots and provides fast, even heat distribution to ensure your eggs are always cooked evenly, so you never have to worry about over- or under-cooking your eggs. SAFE AND EASY TO USE- This deluxe poacher pan features a convenient Bakelite handle that stays cool to the touch to protect hands from high heat. The included tempered glass lid with Bakelite knob offers a secure, safe fit and lets you monitor your eggs during cooking while the innovative steam vent locks in the proper amount of moisture, so your eggs are always cooked perfectly and taste even better. QUICK FOOD RELEASE AND CLEAN UP- While most poacher pans feature plastic insert cups that are susceptible to melting on a hot stovetop, this egg cooker stainless steel poacher pan features convenient nonstick coated cooking surfaces and individual insert cups that can be easily removed, cleaned quickly, or put into the dishwasher, so you can get on with your day and not spend unwanted time cleaning up. MORE VERSATILTY AND STYLE FOR YOUR STOVETOP- Simply remove the insert with the individual poached egg cups, and use this egg poacher as a sauté pan to prepare other home cooked meals. With a sleek, polished look and an elegant satin line, you'll not only have a more practical cooking vessel but also an added touch of style for your stovetop. If you have any questions about this product by PremiumWares, contact us by completing and submitting the form below. If you are looking for a specif part number, please include it with your message.